sound and looked up. Far, far above, at a height of nearly 30,000 feet a giant silver plane circled above them. They had never seen such a plane. Many assumed it was one of their own but other worried that this sleek silver winged beast might just belong to the enemy. Those Americans were full of surprises. Rumors were flying about that the southernmost island of Kyushu had been hit by a raid back in June with an altogether new type of plane. Little damage had been done, so they were told, but reports were heavily censored and it was hard to know what to think. Some may have remembered the April 1942 attack, over two years before, when sixteen B-25 American bombers had dropped their payloads on the massive city. Though it was a quite shock at the time, that American raid hadn’t amounted to much either and they hadn’t seen any enemy planes since. Until today. Except this lone wandering bird now high above them. Most shrugged their shoulders and went on about their business paying it no mind. Others were worried. This wasn’t a good sign, no, not a good sign at all. They had good reason to worry. It was the first appearance of the B-29 “Superfortress” over Tokyo. That day it dropped no bombs. It simply circled the sky for about thirty minutes and then departed. There were no bombs or guns on board, only cameras. On this occasion the crew simply took pictures in preparation for raids to come. These few Americans way up in the sky were making plans for Tokyo’s destruction. The war that had been distant and far away all this time for the people of Japan was about to land in their laps. The plane that carried those photographers was a wonder to behold, even from a distance. Being twice the size and weight of it’s closest rival in the US arsenal, the B-17, or “Flying fortress”, the B-29, bristling with heavy machine guns at the nose, waist, top, and tail, was therefore dubbed the “Superfortress.” It could go about 55 mph faster and had twice the range as the B-17-just what was needed for the incredible distances of the Pacific theatre. With a wingspan of 141 feet, this thing was truly an engineering marvel, a state of the art world war two bomber climbing higher, going faster and farther, and carrying a much heavier payload of bombs than anything that had preceded it. It was rugged and could withstand heavy punishment. And best of all, at least to the eleven man crews, it was pressurized, meaning that they didn’t have to wear the bulky sheepskin clothing and heavy gloves and oxygen masks required in other bombers. It was designed, tested, and manufactured at four huge factories in the United States-100 per cent American made-the biggest and baddest bomber ever. No other nation had anything like it. Hopes were high and great things were anticipated when the first squadrons of these agents of destruction arrived in the Pacific theatre of operations in 1944. It was not, however, in spite of all the high hopes, an instant success. The B-29 was, at first, an exasperating disappointment. Operating out of airfields in China in the Fall months of 1944, the first missions against targets in Japanese occupied China were only partially successful. The enormous four engine birds were designed for high-altitude precision bombing. At their 30,000 feet cruising height the bombers were out of range of most anti-aircraft guns as well as interceptors (fighters) making the bomber crews relatively safe from the enemy. * This was a welcome change. Up in the stratosphere the bombers pilots and crews discovered that they were afflicted by another enemy, one they hadn’t counted on. Put simply, flying that high made it difficult for the B-29s to hit their own targets so far below. The Norden bombsight, a sophisticated piece of equipment installed in nearly all American bombers at the time, was not effective at the excessive height, due not so much to the distance per se but to powerful crosswinds encountered at that level . Tossed about up there by a 150 mile an hour Western wind, B-29 pilots were like cowboys trying to control a bucking bronco and the bombardier was like a rifleman trying to hit a tiny distant target from a galloping horse. The Japanese weather got crazy six miles up making precision bombing nearly impossible. No one in the Army Air Corps had anticipated this. Under such conditions, few bombs fell on their intended targets. And a bomber that can’t hit it’s targets is of little use, regardless of how big it is or how fast or far it can go or how many bombs it can drop. The US wasn’t going to win the win the war with Japan by bombing rice paddies and private homes. Dockyards, railroads and factories manufacturing the munitions of war would have to be destroyed and if the bombers couldn’t accomplish that the whole strategic bombing campaign was a gargantuan and terribly expensive exercise in futility. It didn’t take the Japanese long to figure this out. Those who were initially nervous began to breathe much easier. In the early part of 1945, after several months of witnessing mostly futile bombing runs, the Japanese came to believe that the formations of sleek, silver B-29s seen high above them were not to be feared-not much anyway-a lot of bark but not much bite. More of a big nuisance than anything. Japanese production clipped along with little interruption, hardly missing a beat. American officers examining after mission photos counted holes in the rooftops of the giant industrial sheds in hopes that some damage had been done inside. It seemed that the enormous US investment in the B-29 was going to be all for naught-millions of taxpayer dollars, time, material and precious lives down the huge Pacific drain. No one was more frustrated with this situation than General Curtis Lemay, the newly appointed thirty-eight year old commander of Bomber Group XXI located at the huge new B-29 base at Guam, in the Mariana Islands, about twelve hundred miles SE of Tokyo. When those islands were seized in the late Summer of 1944 and the airfields installed soon after, the US finally had an airbase within bombing range of Japan itself. This was a dream come true. By late November hundreds of very-costly, shiny new B-29’s lined the runways. But how should they be utilized to their maximum effectiveness? No one, it seemed, had an answer. The tactics of the previous six months weren’t working so well. Puffing on his ever-present pipe and listening intently, a frustrated, but determined General Lemay spent a great deal of time interviewing colleagues and subordinates taking in lots of ideas and suggestions. Finally, in late February, 1945 Lemay gathered his staff and announced his new plan for the bombing of Japan. Legend has it that two of the men nearly passed out when they took in his words. All were utterly astonished. To a man, so we’re told, they believed that their new commander was completely out of his mind. “We will fly over at night and drop from thirty thousand to only ten thousand feet getting us closer to our targets. We will shed all excess weight, including guns, gunners, and ammunition and carry a heavier payload. We will not fly in formation as usual. And we will drop mostly incendiaries. We will methodically, piece by piece burn Tokyo to the ground, every bit of it except the Emperor’s palace and compound.” Said General Lemay to his staff and squadron commanders. “Those of you who don’t have the stomach for this can be reassigned.” There were, of course, howls of protest and lots of worried gasps, but no one flinched. Most of them gulped and simply assumed that this next mission would probably be their last. They were quite sure that it would be like the recent Marianas Turkey Shoot in reverse-with much bigger and easier–to- hit targets. Japanese anti-aircraft fire alone would eat them alive. When it was announced to the crews, men crossed themselves, wrote letters home, “got their affairs in order” and made ready for what they were sure was to be a suicide mission. General Lemay was firm but he was also worried. His reputation and career were on the line. There was no guarantee that his new approach would work. And if B-29 losses were unusually and unacceptably heavy he would carry the stigma for the rest of his life even if he retained his position. And he would retain his position only if they got results. Worst case scenario? Heavy losses among the bombers and minimal damage to Tokyo. That would be a bloody disaster. Even the B-17s bombed from no less than twenty thousand feet. What he proposed had never been tried and it could fail. But they couldn’t keep on as they had been. Something radical and different had to be attempted. Of course, there was an up-side. If the raid succeeded. Curtis Lemay would be a hero and a household word in the US. If so, he reckoned he could handle it. The pilots and crews didn’t have long to mull it over. The raid was scheduled for March 9 and the men and planes made ready. A unique mix of napalm incendiaries designed to pepper the surface below at fifty foot intervals was loaded into the bomb bay of each plane. Taking off from bases at Guam, Tinian, and Saipan, an armada of 334 planes gathered in the air in a long stream and made for a specified three by five mile target area in Tokyo containing dozens of industrial and commercial targets and, unfortunately, hundreds of thousands of residents. When they reached their destination the long parade of planes flew over at the specified low altitudes dropping their lethal loads for nearly three hours. The results were stunning. Below them, a huge portion of Tokyo became a fiery hell. An enormous firestorm like that which afflicted Dresden in Germany, only larger, resulted. Surface temperatures were so great that it became uncomfortable inside the bombers. For the people of Tokyo, the war had come home to them in a manner that they could never have imagined. On that day nearly 84,000 died and over a million were made homeless. Nearly sixteen square miles of the capital city of Japan was destroyed. No more counting holes in rooftops; the rooftops and everything under them had been reduced to a huge pile of worthless ash. General Lemay’s gamble had paid off spectacularly. For the US and it’s new bomber, the March 9 Tokyo raid was a triumph. Perhaps best of all, bomber losses were low. Curiously enough American fears had been mostly unfounded: Japanese resistance had been no worse at the low altitude than at the high altitude. Curtis Lemay became a hero. Finally, someone had found a use for this expensive, magnificent and now terrible warplane. Other equally destructive raids on other Japanese cities were to follow in the months to come ending finally in the bombing of Hiroshima and Nagasaki. The ENOLA GAY was, of course, a B-29. By the time of the surrender in August, American planners were having a hard time coming up with new targets. Few remained. Japan had been nearly bombed into the stone age. The devastation wrought upon that country was astonishing and, thankfully, never repeated. And in those final months, except for a Navy raid or two (from carriers) upon the Tokyo harbor, it was all done by B-29’s. On March 9, 1945 the B-29s flying over Tokyo had become chariots of fire, hellish instruments that would seal the fate of the empire of Japan. In the final act of the long and bloody Pacific war, the B-29 had the starring and decisive role. The investment had paid off. *Enemy fire, from anti-aircraft or interceptors, was never the biggest fear/threat anyway. Most bomber crew deaths resulted from accidents or mechanical malfunctions. After the Japanese surrender in August 1945, it was said that American authorities entering the defeated country were interested in getting their hands on two particular people who were to be immediately arrested and put on trial: Hedeki Tojo, the army warlord who, more than any other, pushed his nation into war with the US, and the infamous radio announcer: Tokyo Rose. When they found Tojo, they found him only a few minutes after he committed hari-kari, a ritual suicide attempt. He botched it however, revived and was put on trial and later convicted. “Tokyo Rose” , whoever she was, had blended into the crowd and was nowhere to be found. About a month after the war’s end in September, 1945 two clever journalists put the word out that they would pay $2000 for an interview with “Tokyo Rose.” Badly in need of money so that she could get back home to the states a woman living in Yokohama stepped forward to give the interview and claim the reward. Though she found the term “Tokyo Rose” strange, and laughed when her questioners insisted upon using it, she cheerfully answered all queries making it obvious that she had little to hide. As any lawyer would now say: big mistake. As soon as the interview with journalists was finished she was arrested and taken to Sagumo Prison and placed in a cell alongside former Japanese officers awaiting trial for war crimes. She never saw a dime of the money. The whole thing had been a trap. What about the Emperor? His Imperial Majesty? Could a “Jap” get any more guilty than this guy? General McArthur had given strict instructions that he was NOT to be arrested or harassed in any way. Only specially authorized personnel were allowed to enter the Imperial Compound. To all but a few, the Emperor was off limits. Another tale for another day perhaps. The naïve little woman arrested was Iva Toguri D’Aquino. And she had indeed been involved in broadcasts to American servicemen in the final months of the war, something she made no effort to hide. During her initial confinement in Sagumo Prison she cooperated in every way, eagerly telling the authorities her story: that she had been born and raised in the US but while visiting extended family in Japan found herself stuck there when the war started. After keeping a low profile and avoiding notice for most of the war she was finally snatched up by local officials, brought to the radio station and forced to make the broadcasts. Japanese officials had ways of forcing people to do things. During hostilities she knew nothing of the moniker “Tokyo Rose,” having always identified herself on air as “Orphan Ann.” Her English-challenged superiors, she insisted, had been unable to closely monitor the content of her shows and no one else, it seems, tipped them off to what she was really saying, comments, she insisted, that were in no way treasonous, as regarding US security, or destructive to US morale. When skeptical investigators, a group that included members of McArthur’s own staff, listened to tapes of her show, called the “Zero Hour” and interviewed various co-workers including three American and Austrailian POW’s and friends of her’s who had also been forced to work at the same radio station, they were forced to admit that she was telling the truth. Her friends also claimed that she had, at considerable risk and expense to herself, smuggled food to starving American POWs confined nearby. After being held for over a year the charges against her were finally dropped and she was released. When asked what her plans were she replied that she simply wanted to go home to the United States. But money for passage home was still a problem. And she and her husband (they had met and married during the war) had no choice but to remain in Japan. Having been assured that the matter was dropped Iva returned to her relatives in Yokohama. Other broadcasters had preceded “Orphan Ann.” She was simply the last in the “Tokyo Rose” lineup. Curiously, and as far as I can tell, investigators made no effort to find and question them. After the publicity surrounding Iva’s arrest these women were, understandably, eager to “stay under the radar” and out of sight. US occupation authorities simply dropped the matter. They must have had more important matters demanding their attention, things like reconstructing a nation that lay mostly in ruins and putting together a new government and constitution. 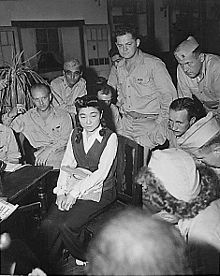 The trial of “Tokyo Rose” that took place in the Federal District Court of San Francisco in July, 1949 was one of the longest and costliest in US history. Though prosecutors went after her with a vengeance in the end she was convicted on only one count, “overt act VI” charging that she had said after the battle of Leyte Gulf: “Now you fellows have lost all your ships. You truly are orphans. How will you ever get home?” Iva denied that she had ever said it, a vague allusion to a battle that had already occurred, hardly a violation of US security. The conviction occurred because the prosecution, with resources to spare, had brought over her former bosses to testify that they had heard her say this though they furnished no tapes or corroborating witnesses to prove it. Years later, when the case was reopened by investigators, it was discovered that her former bosses, trying to curry favor with American authorities and save their own skins (since they themselves were threatened with prosecution), had lied. Imagine that. They cut a deal and it worked-well sorta. They had hoped for a much harsher sentence. The trial came to an end and Iva Toguri went to jail and the matter was officially over. The sentence was ten years in prison plus a $100,000 fine. Iva served six years of the sentence before being released in 1955. She never paid the fine; she was penniless. By this time the public had forgotten about her. She moved to Chicago to be with her parents, who themselves had spent time in a confinement camp during the war, and lived there until her death of natural causes in 2006 at the age of ninety. She was never reunited with her husband. He had remained in Japan having been denied a visa to enter the US-a sad tale indeed. There were however, a couple of bright spots in her tale. In the nineteen seventies two journalists (already alluded to) became interested once again in her trial and released a report proving conclusively that the testimony against her offered by her former employers at the radio station in Japan had been engineered by FBI agents and was therefore fraudulent. Upon hearing of this, President Gerald Ford, himself a veteran of the Pacific Theatre, pardoned her in his final official act before leaving office in 1977. Nearly thirty years later, in 2006, the World War Two Veterans committee awarded Iva the “Edward J. Herlihy Award” honoring her “indomitable spirit, love of country, and the example of courage she has given her fellow Americans.” Friends said that she considered this honor “the most memorable day of my life.” It came just in time. She died later that year and went to her grave free at last of the curse of Tokyo Rose. Her friends and family said that she never considered giving up her US citizenship or going back to Japan. She remained in the US, her country of birth and the land she loved, and despite everything, was fiercely loyal to the end. She was no traitor, Iva Toguri, God bless her, was a hero. No, there never was a “Tokyo Rose” anyway. This was simply a generic, catch-all name that American servicemen in the Pacific had placed upon all of the women who made the broadcasts. Though it can never be established conclusively, there could have been, so some scholars have speculated, a dozen of them. It is likely that a few of them did the broadcasts willingly and with enthusiasm. It is likely that a few of them really were traitors. But we’ll never know. They’re lost to history. On the other side of the world “Tokyo Rose” had a counterpart who was not lost to history. Our GI’s in Europe during hostilities listened to one they called “Axis Sally”, a certain Mildred Gillars, a native of Maine who immigrated to Germany not long after Hitler came to power and later, after the US entry into the war against Germany, made Nazi propaganda broadcasts specially and specifically designed to undermine the morale of US service persons. She was for real and predictably enough, was nowhere to be found at the war’s end. After a three and a half-year search she was finally located, arrested and brought to the US to stand trial for treason in 1949. Her trial, occurring about the same time as that of Iva Toguri, did not, curiously, attract much attention. Once the trial was underway, there was no need for the prosecution to “take the low road.” The case against her was very strong. Astonishingly enough, she was only convicted (like Iva) on one count. Having been an actress in Germany prior to her broadcasting days, we can only guess that she must have put on an impressive show making jury and judge feel sorry for her. Still she served ten years in prison. After her release in 1961 she joined a convent and died in 1988 at the age of 88. Maybe the daily rosary helped her guilty conscience. Unlike her Japanese-American counterpart, there has never been any doubt, then or now, about Mildred Gillars: she was a traitor to her country. And she received no pardon. Well…not in this world anyway.